In this article, we’re reporting the confirmation of giant ragweed (Ambrosia trifida) plants with resistance to cloransulam-methyl (FirstRate) in a population located in Columbia County, Wisconsin. Cloransulam-methyl is an acetolactate synthase (ALS) inhibiting herbicide that is commonly used for giant ragweed management in soybean. In this instance, the suspected resistant giant ragweed population was found in a corn-soybean rotation that was part of a long-term experiment at the UW-Arlington Agricultural Research Station. Field observations suggested that giant ragweed plants had survived exposure to cloransulam-methyl applied both preemergence and postemergence in soybean. These plants readily out-competed soybean and produced large amounts of seed. To confirm and quantify resistance to cloransulam-methyl, seed was collected from surviving plants for subsequent experiments under controlled conditions. In greenhouse experiments at UW-Madison, the level of resistance to cloransulam-methyl was found in these plants to be more than 60-fold compared to sensitive plants. Cloransulam-methyl applied at the labeled rate (0.3 oz FirstRate/acre) had little or no effect on resistant plants compared to sensitive plants (see Figure 1). At 10-times the labeled rate, resistant plants showed little or no reduction in growth (shoot biomass production). At 100-times the labeled rate, resistant plants typically survived but showed some injury symptoms and reduction in growth. At high rates, we observed some variability in response to cloransulam-methyl among resistant plants, suggesting that segregation of the resistance trait may be occurring in the field population. Even so, resistant plants typically demonstrated a high level of resistance to cloransulam-methyl. Giant ragweed with resistance to ALS-inhibiting herbicides is not unique to Wisconsin. Resistant populations were identified in Illinois, Indiana, Ohio, and Iowa more than 10 years ago (Heap 2013, www.weedscience.org). Since then, giant ragweed with resistance to both ALS-inhibitors and glyphosate (i.e. multiple resistance) has been confirmed in Ohio and Minnesota. 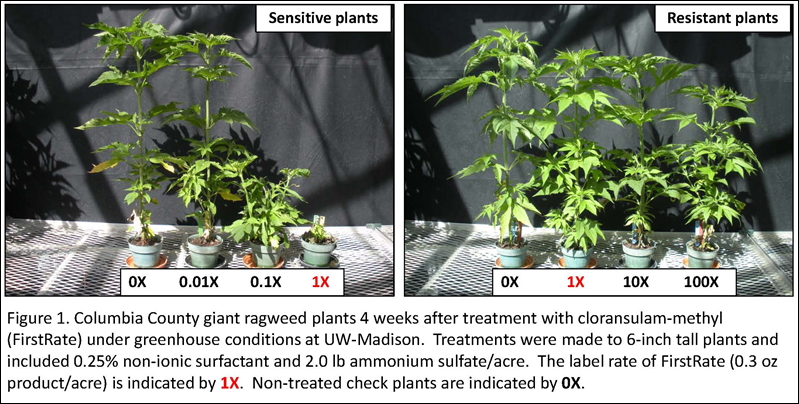 Although results from our greenhouse experiments indicate that the cloransulam-methyl resistant giant ragweed from Columbia County is not resistant to glyphosate, we have previously confirmed giant ragweed resistance to glyphosate in Wisconsin (https://ipcm.wisc.edu/blog/2012/06/giant-ragweed-resistance-to-glyphosate-in-wisconsin/). In each of these instances, field histories suggest that repeated use of a single mechanism of herbicide action for weed management was an important factor in selecting for resistance. Use herbicides only when necessary. Rotate herbicides with different mechanisms of action from year to year. Use multiple herbicide mechanisms of action that are effective against the most troublesome or herbicide‐resistance‐prone weeds. Use diversified crop rotations; three or four crops in rotation reduce risk of resistance more than one or two crops. Integrate mechanical control practices (e.g. rotary hoeing and cultivation) with herbicide use. Scout fields regularly and control weed escapes. Refer to Pest Management in Wisconsin Field Crops – 2013 (UW Extension/Cooperative Extension publication A3646) for more information on herbicide-resistant weed management. Several best management practices for reducing the risk of weed resistance to herbicides can also be found at the Weed Science Society of America web site (www.wssa.net/Weeds/Resistance/index.htm).